Gray Line is named such because the lower part of the rule is gray. In the file links below the gray rule is described as Dark, Medium, or Light. Gray Line is available in seven rule heights and includes two rule styles - Regular and Tall. Gray Line also comes in Blank-Top. The handwriting paper began as an image and pictured below is the actual colors used in the images. This sample is just to give you an idea of possible printer output. The actual printer output will (or might) be darker than the shades shown in the illustration below. The smaller ruled papers are available in medium and light and in the case of the Tall rules, in the lightest shade. You might wonder why - the dark shade in the smaller rules made me feel queasy when I used it during the "usage stage" when I printed the paper and wrote on it. Regular and tall refers to the size of the 3 parts that are contained in the handwriting rule. I made up these terms and definitions for my purposes. Regular Rule: The 3 areas in the handwriting rule are either the same height or almost the same height. 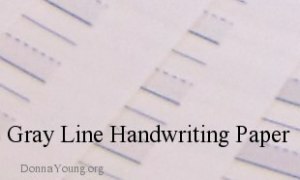 Tall Rule: The 3 areas in the handwriting rule are not the same height. The middle area - the rule in which most letters are started is much smaller than the upper part of the rule. In the case of the files on THIS page, the two upper parts are sized thusly: the middle rule is one-half the size of the top rule and meanwhile, the top rule inherited the extra height. See image above. A number following the shade description (Dark-5) indicates the number of ruled lines. The number is there because it differs from the other files in the same rule height. All files under Tall Rule are shaded Light; the upper line is lighter as well. The number listed after some of the file names indicate the quanity of ruled lines. List Top is a "Month on a Page" type of calendar. It's a calendar below a 2-column list. Drawing with Children - I've tried to unravel the mystery of how to plan this popular book. Calendars - The first section to have complete overhaul, the menus are restructured and more pages are added. Subscribers will enjoy seeing their exclusive content under my standard URL.